With the current advanced technology, information networks and computer networking has become a critical aspect for the success of any business whether small or large. The setup networks support services and applications, they connect people and allow them to access and share resources within the company. This helps the business to continue running effectively. As technology keeps advancing, the complexity of the networks also advances to meet the daily requirements of the business. Any business in the current society now demands around the clock customer service. These networks are expected to be available all the time and should be smart to enhance security. As operations are carried out within the company, the networks are expected to adjust automatically to the varying traffic bandwidth to maintain consistency in the response times. To design and build a good network, the network requirements must be identified from the company personnel so as to come up with the best solutions that meets the need of their business. The chosen method in my network design is using a questionnaire to gather the requirements from the users, the sports complex contemporary management and the staff. 1. Questionnaires and the purpose of each question. 2. A questionnaire designed for the staff. What business applications do you use that would need to be supported by the network? -The applications that the network will be configured to work within a sports environment. Do you want to have a shared access to files or multi-user support databases? - this enables the designer to choose between a server-based network and multi-server network. How many staff members are present in the company that needs network support? -The number of staff members will dictate the type of connections to be used, the type of infrastructure and the best topology to be used in such an environment. What security level do you expect the network to offer? -High, medium or low? Based on the type of security the staff members propose, the network designer can now make a choice on what security measures are to be added to the network and can also implement access restrictions. What is the existing infrastructure and security policies? -This helps the network designer to know what policies and security measures must be retained and how to upgrade the existing network if one is already present. A questionnaire designed for the Users. What resource-intensive services will you use in the network? For example, videos streaming services etc.- This is important in letting the designer know what type of equipment to use. In our case, more routers and access points will be required in the sports complex to service the users and the company staff. What connection speed would you prefer? - Based on the user's response, the network designer is now able to choose the right equipment and calculate the correct budget needed to make the improvements if any. Is internet access necessary? - Since it’s a sports complex network, services such as video streaming may be expected meaning high bandwidth connections are most suitable for optimum performance. What do you feel that needs to be improved or incorporated in the network? - This question helps the designer to know what type of topography and network infrastructure is best suited to offer the expected network speed. A questionnaire designed for the management. Who are the key end users, sponsors, and stakeholders? - What the network is expected to achieve and the expected time range for completing the network design and its implementation. At the end of the network implementation, the network should be able to achieve all the set milestones. What are the business outcomes that you aim to achieve? - Every network should be designed to help the company achieve its long-term objectives. The question allows the network designer to understand better what fundamentals are required so that the network can contribute towards the achievement of the company’s goals. Are there any specified protocols to observe or any specific vendors and equipment? - In planning for what type of equipment to use and the protocols to implements, the company should provide any protocols that they want to be incorporated and the specific vendors outlined if any. What are the network implementation milestones and timelines? - This information helps the network designer to know what security measure to assign the end users, the sports complex sponsors and the stakeholders in the sports complex company. What the network is expected to achieve and the expected time range for completing the network design and its implementation. At the end of the network implementation, the network should be able to achieve all the set milestones. How much budget is the management willing to allocate towards the network design and implementation? - Being one of the major factors in network design, the budget dictates the infrastructure to be used, the type of equipment to use, and the network topology to be used. The larger the assigned budget the better and more advanced the network is. For most companies, this is one of the major limiting factors. Outline the desired operational, business and innovation outcomes followed by their technical translation to a technological environment. - For the sports company, the expected network will be expected to boost innovation and enhance operations in the company. The management should provide the specific details of how they wish the network to achieve this. Its important for the designer during the implementation phase. What characteristics does the management desire in terms of load balancing, load sharing, capabilities, manageability, simplicity, performance, cost application, security, and speed?- Important for the designer to decide on which equipment to use to offer the fast connections, infrastructure that is simple to use, a manageable topology that is easily understood and the security measures to employ not to mention assists in selecting hardware that offers optimum network security. Will the network support the business or is the network the business? – If the network is being implemented to support the business then a lot of the applications can be implemented on the user-pcs but if its an online network business then the applications can be server centered or even cloud-based. Do you have enough power to support each hardware component? - Power is an important aspect since a network can operate without enough power. Based on the power supply points the designer is now able to decide the type of topology to implement. After the design is reviewed, the verification procedure is now undertaken where formal verification work reviews are given throughout the design. This is necessary to confirm that that design suits all the company’s functionalities [ CITATION Ros08 \l 1033 ]. Suggested applications for the sports complex company. 1. Conducting demonstrations and lab tests. 2. Comparing the newly implemented design with already proven solutions [ CITATION Pre \l 1033 ]. 3. Considering and implementing alternative calculations. During delivery of the network, validation has to be done. Some of the activities carried out during this process include; An audit of the network delivered to make sure that it delivered the expected results based on all the requirements outlined by the management, staff and the users. Confirmation is done to ensure that all the customer requirements are met by performing an agreed program acceptance test [ CITATION TAn94 \l 1033 ]. The network was designed and implemented using Boson netsim 10 software. The terminals were all configured with their respective bandwidth capacity, reliability and delay values as specified in table 1. Configuring the application sets on terminals. Attached is a screenshot showing the configuration of LAN A with the application set 1. The bandwidth capacity has been allocated for every terminal. In this application set the file transfer protocols were implemented to allow communication between the end user devices through their respective switches. 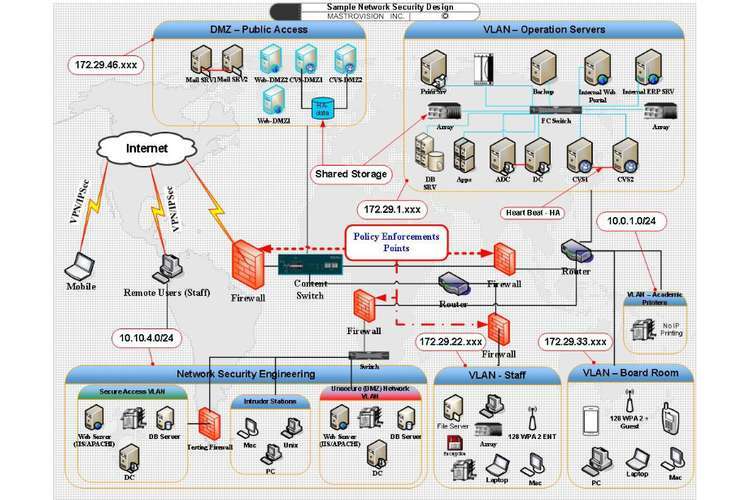 Routing strategic information protocols enabled configuration of the specific bandwidth capacity for each interface connected to the switches. The screenshot below shows the configuration of LAN B. The bandwidth capacity, delay and reliability values have also been assigned using the configure terminal commands. During the implementation of this application set, Enhanced Interior Gateway Routing protocols (EIGRP) were necessary in order to set the delay and reliability values. This was achieved by changing the default metric K-values to the specified values. Each terminal connected to the end user devices was assigned its bandwidth capacity, a reliability of 99.999% assigned to both B1 and server 3, and finally server 2 was assigned a delay value of 80ms. The screenshot below shows the configuration of LAN C. The bandwidth capacity, delay and reliability values have also been assigned using the configure terminal commands. Since LAN B is also connected to router B, Enhanced interior Gateway Routing protocols (EIGRP) were also used to assign application set values to the interfaces. The respective bandwidth capacity, reliability and delay values were implemented by changing the default metric K-values. This enabled the automation of the routing configurations and decisions. Attached is a screenshot of the whole network topology after the design and all the application sets were implemented. Multilayer switches were used to connect the routers. This allowed the use of 3-layer routing information protocols (RIP) which allows communication between the different layer devices. The RIP protocols also enable Inter-Vlan communication between the networks. The main objective of the network is to keep sports complex customers satisfied by making sure that their requirements are fully met. In some occasions, the network design and implementation can be time consuming and expensive based on the extensibility and size of the company. As identified, involving the end users, staff members, and the management during this process is essential so as to better understand their requirements and avoid any misunderstanding of the requirements. A problem is easily fixed if its identified earlier and helps avoid unwanted expenses in the end. The sports complex network can now be comfortably implemented without any delays since all the requirements are given in the questionnaires. A successful network system implementation can be expected. 1. T. J. Rosandich, "Information Technology for Sports Management," The Sports Journal, vol. 1, no. 2, pp. 1-6, 2008. 2. S. Pretty and M. Norris, "A quality approach to network design," Designing the Total Area Network: Intranets, VPNs and Enterprise etworks Explained, pp. 301-312.